The focus here is on the water. Luxurious sun loungers are carefully arranged around it. 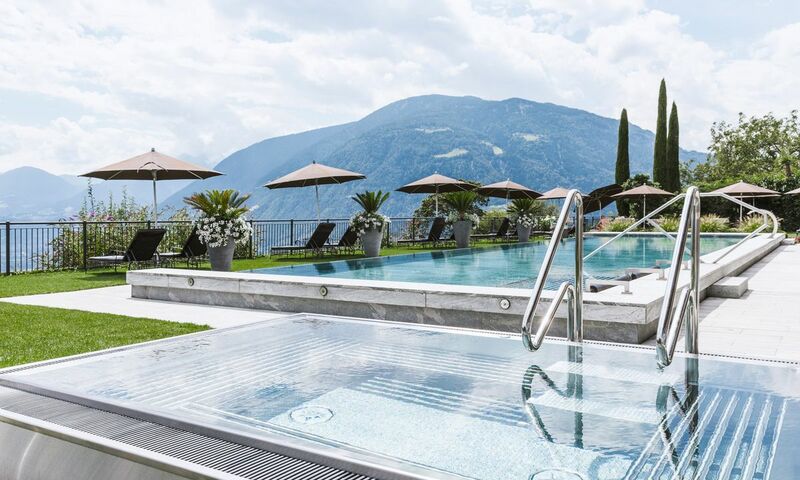 Whether you prefer to swim indoors or outdoors, at Hotel Patrizia, there are several opportunities for an energising water workout or for relaxing. Delight in the lush world around you, gaze at the white fluffy clouds drifting by, and enjoy seeing the fruit trees dance in the gentle breeze that fills the valley with fresh air. 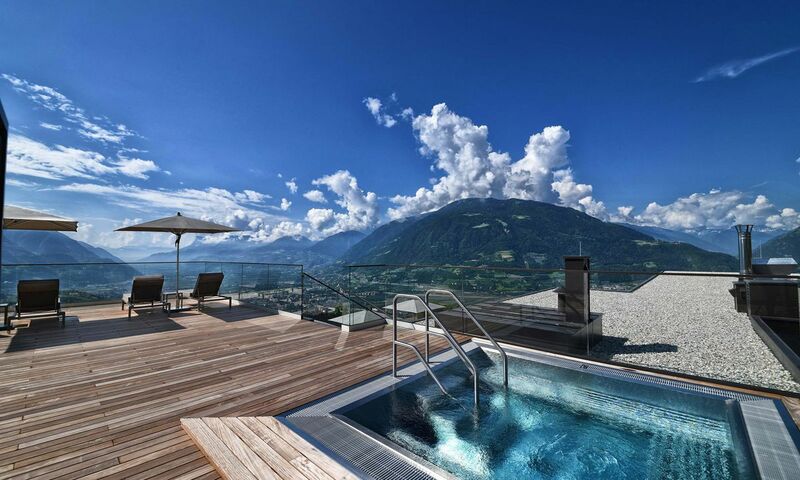 Our pools provide the most stunning views of the countryside and faraway mountains on the horizon. 220 days of sunshine turn our pools into places of joy and happiness. The 20 by five metres large outdoor pool is a cosy 31 degrees in autumn and refreshing 27 degrees in summer. 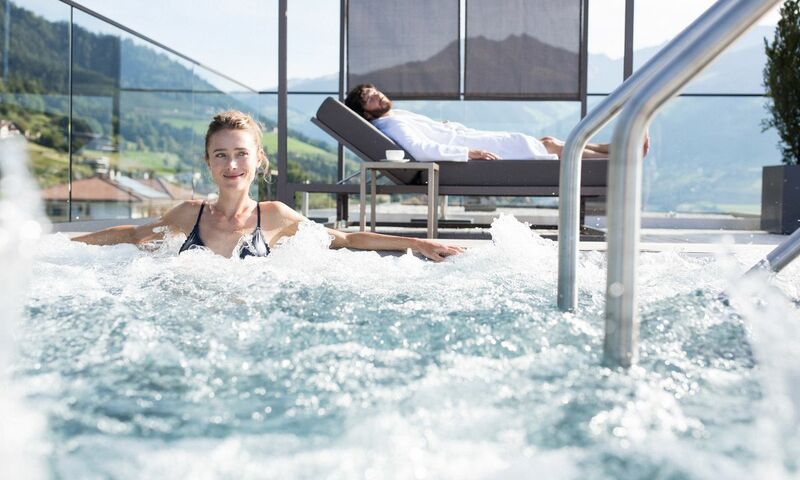 Our ten by ten metres large indoor pool that features large panoramic windows and is heated to 30 degrees guarantees rest and relaxation at the highest standard. 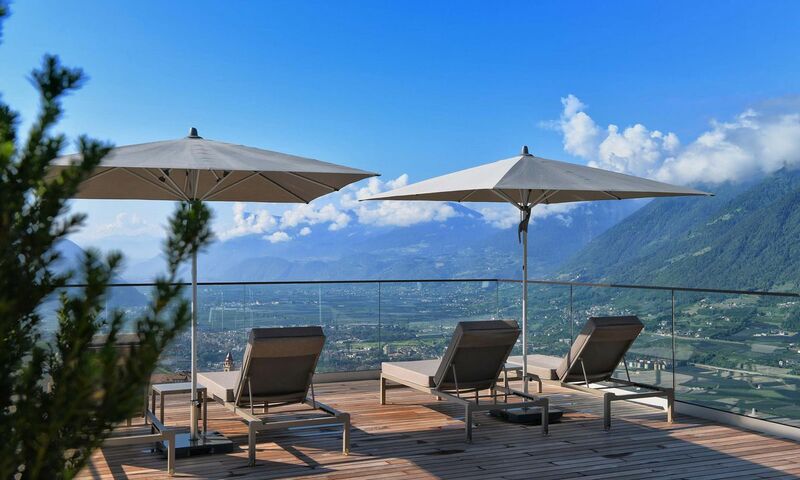 Two whirlpools, one surrounded by the luscious green grass, and one offering excellent views from our roof terrace, promise even more opportunities for revitalisation against the magnificent backdrop of the Merano countryside. Our indoor pool is open daily from 7 am to 7.30 pm. Our wellness facilities are available from 2 to 7 pm and from 11 am on inclement weather days. Plenty of space and an abundance of loungers means that guests don’t have to bother with reserving a spot.